Across Paris to make station transfer and across Strasbourg to Kehl to the campground. At the beginning of the trip, it made me nervous to think about rolling up in a town and not being able to find accommodation. For a week or two I made a point of trying to pre-arrange our next night's accommodation, using Air BnB, Booking.com, HostelWorld.com, and so on. Without fail, our pre-arranged accommodations ended up with some kind of a hassle... usually the pressure of making it to the place that was booked (sometimes I didn't feel like doing all the kms), or finding that the place I'd booked was hard to find or perched on a hilltop. A few times, we just played it by ear and found a campground or hotel that was right along the path. So much easier. After a couple of weeks I relaxed and we've been randomly finding our accommodation ever since. It's much better. I am SO GLAD every day that I have my pStyle along. I've used it pretty much every day. In nasty public toilets, in squat toilets, by the side of the trail when there are nettles, by the side of the trail where there's insufficient privacy... I just pStyled my way all the way across France! It is absolutely essential gear. One of the things that I took the longest in planning for this trip was electronic devices - what to bring and what to leave behind. I decided to leave behind the Mighty iPhone because I'm not going to pay Rogers' exorbitant roaming fees, and I'm not going to unlock the iPhone to get a European service. I bought an old cellphone through Kijiji and inherited another old cellphone from my mom, thinking that one of them might work in Europe. They didn't - we ended up buying a cheapo cellphone in France with a pay-as-you-go sim card. The other piece of electronics we're using is my Windows Surface. I wanted to make sure I could continue to take care of certain things while I'm away, for example, my corporate fiscal year end accounting, which will happen at the end of July. I decided to buy a tablet, and because I like the iPhone so much, I thought about getting an iPad, but I need Windows software for some of that FYE stuff, so I settled on a Surface. I have been able to use the Excel program to update my GL, which is one of the main things I needed it for each month. I used it for one big trip previously - the trip to the Caribbean last November with Brent and Ed. Although I have been extremely pleased with the Surface so far, it doesn't have all the software I'd like on it - one deficiency is in photo editing software. I'm kind of particular about photo editing software. I haven't found a way to reduce the size of photos to a size acceptable to DAMDetails, so my work-around has been to post the photos on Facebook, then save down the reduced photos from Facebook (which does it for you automatically), then post those photos to DAMDetails. Every day I save the photos from both our cameras to my OneDrive so they are "safe" in the cloud. If we lose a camera, we've only lost one day's worth of photos. Today we're taking the train from Orleans to Strasbourg, on the far east of France... almost Germany. From there we'll ride EuroVelo 15 (the Rhine Route) north for a couple hundred kilometers before heading east to Frankfurt. We bought our train tickets yesterday. Brent stayed outside to watch our bikes while I went in to inquire about the tickets. The guy was willing, but not enthusiastic, to help me in English. 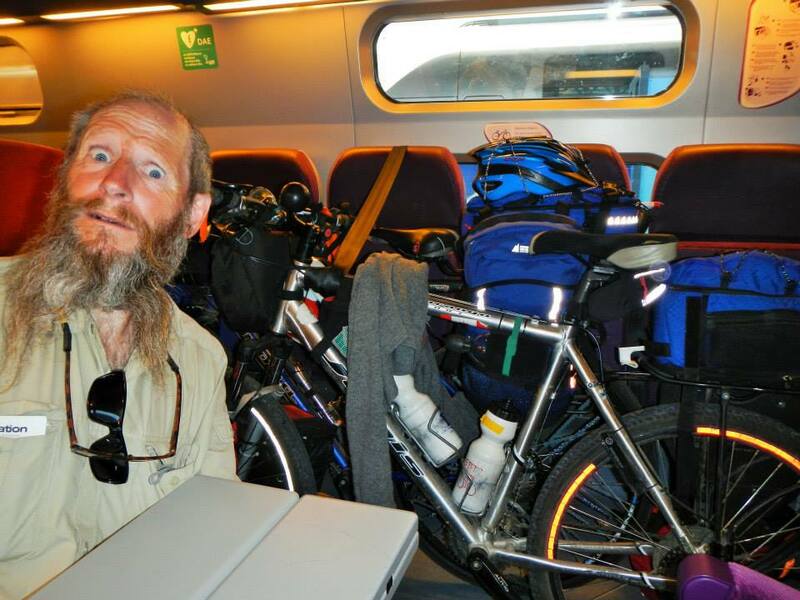 I explained that we needed tickets to go from Orleans to Strasbourg, and that we have our velos with us. Within a minute or so, he was showing me ticket opens... from Strasbourg to Orleans. I can't imagine in what universe I would want to buy a ticket to where I already was, so I'm pretty sure he was doing it deliberately to mess with me... make sure I was paying good attention - sort of a dumbass tourist tax. I passed that test and got a ticket for Orleans to Strasbourg... one ticket. So, I had to explain again that my husband was coming with me... also with his velo... and we would need TWO tickets. Somewhere in the whole process, he asked me if I had baggage for the bikes. I didn't really understand the question and I said we had paniers for the bikes... he just waved and said oh that's fine that's fine. After, when I showed the tickets to Brent, he thought that we had tickets on the bullet train, which doesn't allow bikes. I realized that when the guy asked me if I had baggage for the bikes, he meant, did I have bags to put the bikes IN. Back to the ticket agent we went and talked to someone else, who, upon reviewing our tickets assured us that they were ok for roll-on bikes. WHEW! Another possible SNAFU was the station change in Paris. We had about an hour and ten minutes to make the station change, and my original ticketing guy said we could take the Metro. Brent and I remembered from being in Paris before that the Metro doesn't allow bikes, only the RER train line in Paris allows bikes. But, with over an hour to make the 4km from Station Austerlitz to Station Est, we figured we were ok, but a longer layover would be nice. Back to the ticket agents we went to ask if we could take an earlier train out of Orleans. The lady that we spoke to spoke no English (unlike the other guys we'd had before), but I managed to ask her, in French, if we were allowed to take the 11:35 train instead of the 12:47. I received a resounding "non!" Brent thinks she just didn't understand me and wanted to get rid of me. He has so little faith in my French. I'm sure she understood. Brent and I both used Google Maps to research our route from one station to another, in our own ways, and made some notes. This morning we hung out at Place du Martroi after checking out of our hotel, and before it was time for our train. When we got to the gare and our platform was announced, off we went. The problem was, there were no train cars with a velo icon on them. Brent helped a lady onto one car with her bike, and realized that there were bike hooks in some cars but they weren't marked on the outside of the train cars, like we were used to. We found a car with hooks but no bikes, and on we went. 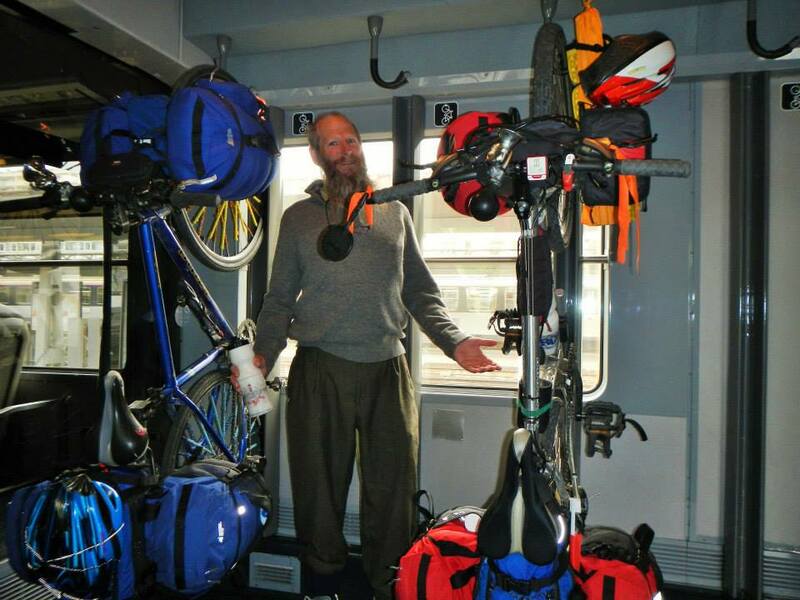 Getting the bikes onto a train car, and then onto a hook, is not bad as a two-person job. Brent goes in front and "receives" the bike to get it on/off the train, and I guide the back. To hoist them up, he does most of the lifting and guiding, and I do a little lifting, and the finer "guiding" of the wheel onto the ook. It helped that we'd been through the process of putting the bikes onto hooks before (traveling to Nantes). Knowing that it was actually POSSIBLE to get our bikes up on the hooks made it a LOT easier to get the bikes up onto the hooks this time. We made it to Paris and got the bikes down just fine. Austerlitz is a nice ground-level gare as well, which made exiting much easier than when we have to use elevators to move the bikes. Using our notes and Brent's amazing sense of direction, we found our way to Gare Est in plenty of time. Paris is an amazing city to ride through. There was heavy traffic, I was unfamiliar with the streets and where we were trying to go. I was what I would call "highly stimulated" the whole ride, but amazingly, I was not scared... not even a little bit. I did, however, make Brent walk around a couple of the enormous busy roundabouts rather than try to ride through them. There are four underground platforms at Gare Est, but fortunately for us, we didn't have to go to one of them. When our train was ready for boarding, we again had to figure out which train car to go in. We were assigned to car 1, but car 1 also had a "first class" sign on it (in one direction) that Brent interpreted as "certainly not our car". So, I asked a guy, who pointed me at car 1. I asked where the velos go and he said "to the right". Cool. OK. So, I poke my head in the car, and there is a row of seats that can be folded up to make room for velos. Stellar. We fought the bikes into the small area for bikes and couldn't figure out why they even allow bikes on these cars - it's a terrible small area, and our car-mates had trouble pushing past our bikes, fat with all the luggage. We found a couple of "bike seat belts" and used one to secure the bikes in place. THEN I saw the bike parking instructions on the wall that indicate that the luggage is supposed to come OFF the bikes before they're parked. Oh. D'uh. We decided to leave them in place unless we were asked to dismantle them. At the time of this writing... we haven't been asked yet. But, we know for next time... if there is a next time. We ended up talking to the guy sitting at our station on the train and he mentioned that Strasbourg was the first city to seriously pursue cycle friendliness. 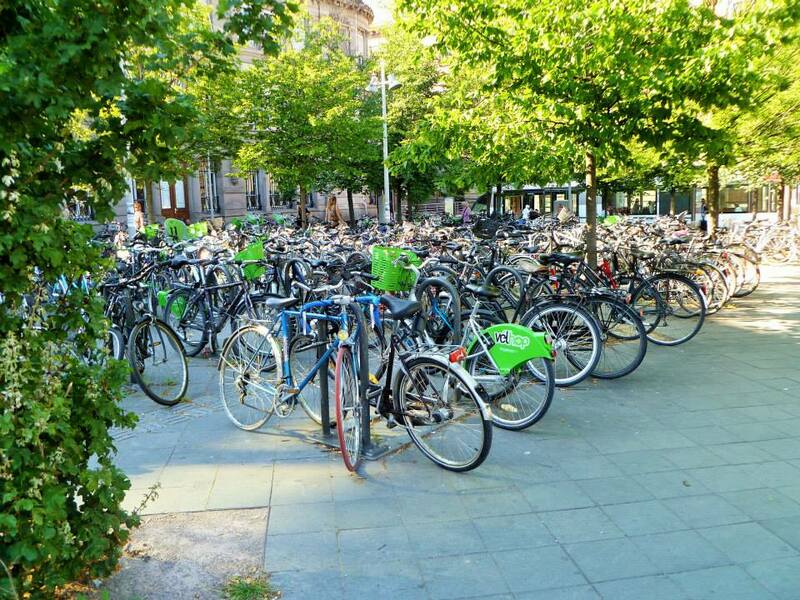 When we got to Strasbourg and got off the train, the first site that greeted us was... seriously a million freakin' bicycles. There are bicycles EVERYWHERE. 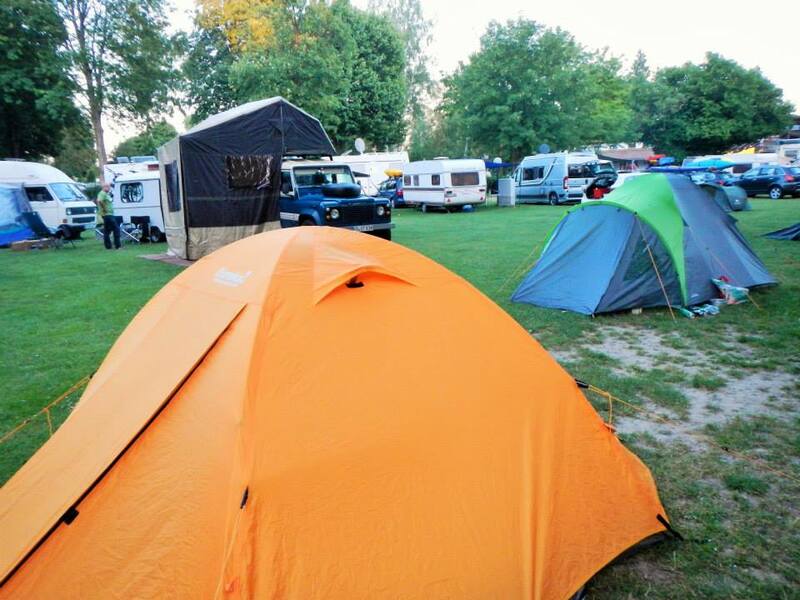 Unfortunately, the campground in Strasbourg is under construction until July. We got directions to the campground in Kehl, Germany, which is just across the river. Off to Kehl we go... and the site that greeted us was... seriously a million freakin' campers!!! There are campers EVERYWHERE! I said that if I was going to stay in a crowded campground, it might as well be crowded to the point of absurdity. And it is. It's Thrasher Cove, only without the surf and driftwood. Oops... we missed the instructions for proper velo transport on this train! I'm pretty sure this campground's motto is "no weary traveler turned away"